This recipe is super easy and inexpensive using all the ingredients from ALDI. It is based on the ALDI Party Popper recipe but I used Maple Bacon instead of the Peppered Bacon. I also mixed in some pecans in lieu of dates in a few of party poppers too. I think you can wrap anything in bacon and they will love it. Knowing that my kids wouldn’t eat anything with nuts in it, I used cheese crackers as filling on a few of these. Let’s just say I went to the party with a full tray and came home with a empty tray. Take half a date, which is cut in half length-wise, add a peanut size piece of brie, a few slivered almonds and place on 1/4 slice of bacon. Roll the bacon. Place on a baking sheet covered with aluminum foil. You can add a toothpick at this time but I didn’t want to spend time on that extra step so skipped it. These are easy to eat appetizers without the toothpicks. Cook at 375 degrees for about 15 minutes or until the bacon is crispy. These are bound to be a hit at any party! Experiment and try other ingredients….I thought of a few other ideas I was going to try in the future – like apple slices, cream cheese instead of the cheese….let your imagination go wild! Slice dates in half lengthwise. Cut brie into small peanut-size pieces. 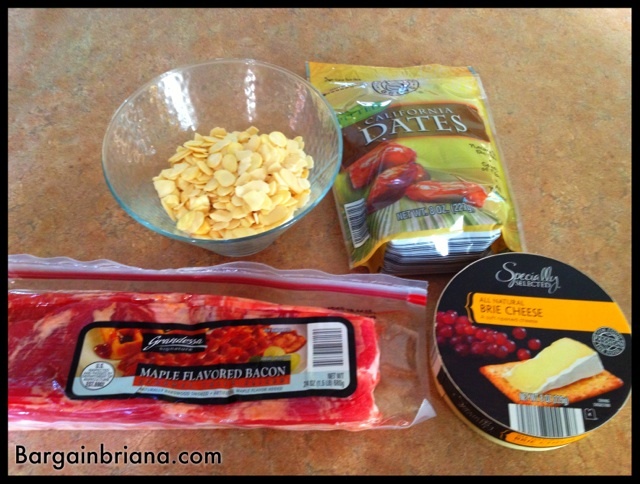 Place date, a piece of brie, and several slivered almonds onto a ¼ slice of bacon. Bake for around 15 minutes or until bacon is crispy. Toothpicks are optional. I left these out but you can place these in the appetizers to make it easier to grab. It is completely optional though.